A man described as in his mid-40s was in critical condition after his vehicle plunged into the Ala Wai Canal at about 10:30 a.m. yesterday, officials said. The man was pulled from the submerged truck by four bystanders who jumped into the murky water to help, according to Honolulu Fire Capt. Earle Kealoha. "Being underwater like that, it was critical that they were there," said Kealoha. "The bystanders really did a lot of the work." The bystanders pulled the man unconscious from the truck, Kealoha said. Firefighters assisted with cardiopulmonary resuscitation until paramedics arrived, Kealoha said. There was no one else in the vehicle. A city ambulance crew took the man to the Queen's Medical Center initially in stable condition. His condition later worsened to critical, according to Honolulu Emergency Services spokesman Bryan Cheplic. 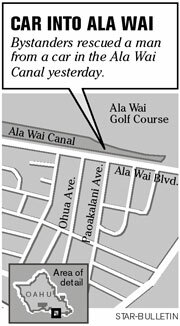 Officials said the man's truck had hit at least two other vehicles and ran a red light before going into the canal near Paoakalani Avenue. One of the bystanders who jumped in to help, a man in his 20s, suffered minor abrasions and jellyfish stings, Cheplic said. He was taken to the hospital in stable condition.